At the 41st RIL Annual General Meeting (AGM) in Mumbai, it was a big day for Jio. RIL revealed the next big plans of Jio after the Jio SIM and JioPhone. The event also marked the company's foray into the broadband market. 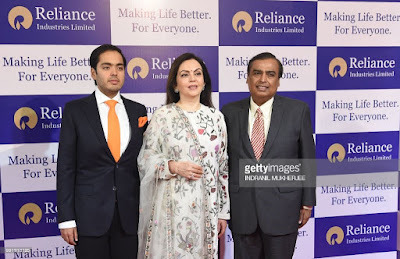 The meeting was kicked off by company's chairman Mukesh Ambani who announced the launch of company's first-ever optical-based wireless connection called Jio GigaFiber. For a brief period, the stage was taken over by Isha Ambani, Akash Ambani and Kiran Thomas who talked about the JioPhone and its new capabilities. They also launched a high-end variant of JioPhone dubbed JioPhone 2. Unlike the previous RIL AGM, this year's event was more about gadget-focussed launches. The company last year had announced new plans along with the JioPhone but this year was about only gadgets and software. No new recharge plans may be because the company in the past few months has already brought number of changes to its tariffs including a new postpaid recharge plan. At he RIL AGM 41, there were several announcements that surprised us. The company announced its foray into the smart home gadgets and also highlighted the process of turning an ordinary house into a smart home using these gadgets. Mukesh Ambani also unveiled the company's plan to enter into the country's thriving e-commerce sector to take on Amazon and Flipkart. "As Reliance transitions to become a technology platform company, we see our biggest growth opportunity in creating a hybrid, online-to-offline new commerce platform," said Ambani while addressing the meeting. " We shall create this by integrating and synergising the power of Reliance Retail's physical marketplace with the fabulous strength of Jio's digital infrastructure and services." The company also announced that it has more than 215 million userbase now in just 22 months of the launch of Jio. There are more than 25 million JioPhone users in India now. * Jio GigaFiber broadband service: The star of the show-- Jio GigaFiber--is the company's optical-based broadband service that aims to connect 50 million homes in India. The beta trials for the service is already running in several cities and the registrations will start from August 15. The company said that the area with the highest number of registrations will be preferred first. Jio engineers will come to your doorstep to set up the connection. The connection will include and router and a Jio GigaTV set-top-box. The Jio router will provide ultra-fast wireless connection and offer wall to wall WiFi coverage. * Jio GigaTV set-top box: Your Jio GigaFiber connection will also include a GigaTV set-top box that will offer more than 600 HD channels, 1000s of movies and songs. The set-top-box will also take voice commands in most of the Indian languages and also offer the multi-party video-conferencing facility. * JioGigaTV calling: This is one unique feature launched by the company at its 41RIL AGM. With JioGigaTV feature, you can make voice and video calls from TVs connected to Jio GigaFiber and GigaTV set-top box. The feature will also allow you to call from TV to phones or tablets connected to some other network. * YouTube, Facebook, and WhatsApp for JioPhone: The company announced new capabilities for JioPhone. Starting August 15, both JioPhone and the new model of JioPhone will support Facebook, WhatsApp, and YouTube. * JioPhone 2: The company announced a new model of JioPhone with horizontal screen and QWERTY keypad called JioPhone 2. It supports voice commands in 15 Indian languages and has a dedicated button for the voice assistant. The JioPhone 2 runs on KAI OS. It features a 2.4-inch QVGA display and supports dual-SIM slots (Nano). The phone will retail at Rs 2999 and will be available for buying from August 15. * Smart home gadgets: Jio also wants to try its hands on smart home gadgets. The company announced a range of products under its umbrella of Smart Home solutions. The company will sell products like audio dongles, video dongles, smart speaker, smart plug, surveillance cameras, video doorbells, smoke sensor, water leak sensor, gas leak sensor, and likewise. These devices can be managed remotely also with the help of Jio SmartHome app. * E-commerce platform plan: Last but certainly not the least, Ambani also unveiled the company's plan to enter into the commerce platform. The company will do it by collaborating company's offline Reliance Retails stores with Jio's digital infrastructure.